This isn't a Death Star model to go with your AT-AT. What's lurking behind it is a clue. Have you got it? 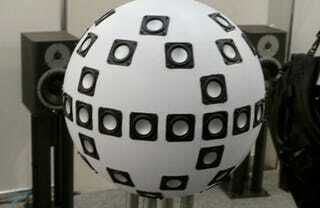 It's a sound system, only with a twist—it has 62 channels for 3D sound. It's from the Japanese National Institute of Information and Communications Technology (NICT), a research firm which is responsible for looking after Japan's frequencies and time standards, and also tests marine radar and maritime safety systems. Amongst doing all those important deeds, they've obviously found the time to jump upon the 3D wagon, with this sound system that is the first of its kind in the world today.